A basement is an important part of the home for many people. Not only does this become a great refuge during storm conditions like tornadoes, but a basement can be used as a gaming room, storage area or even as an additional living space. For many homeowners, it is as important of a space as any other in the home. Because of its location and the fact that majority of the basements are below ground, it is common that humidity and moisture will build up in this living space. Because of the damp conditions, it is easy for such things as mold and mildew to take hold due to the amount of moisture, which not only leads to damage to your home but creates unsafe health conditions. This is why it is imperative that you take the kind of steps to control this moisture buildup in your basement. The perfect solution is the basement dehumidifier. This handy appliance can remove excess moisture from the air, not only creating a moisture-free environment, but also keeping temperatures regulated so it is much more comfortable in the basement area as well if you have a basement, this is the kind of appliance that is absolutely mandatory. But you need to consider certain things before buying a basement dehumidifier to find the best unit as per your individual needs. When Do You Need a Basement Dehumidifier? How to Determine the Right Capacity of Dehumidifier You Should Buy? What Is My Recommended ACH & CFM? What to Look for in the Best Dehumidifier for Basement? As with any review you will read online, it is extremely difficult to determine whether you can trust the author of that review or not. Before writing this review, our group had read literally hundreds of these kinds of reviews, always wondering if you could trust the person who wrote them. After all, can you be sure that the person who wrote the review has the expertise to make this assessment? Can you be sure that they are being paid to give a positive critique of one product over the others? These are the kinds of things that concerned us and so, as we put together this basement dehumidifier review, we wanted to make sure that you can have confidence that the information you are receiving is trustworthy and accurate. This is why we conducted a four-year process of considering over 20 different basement dehumidifiers so that we could give you an accurate review. We wanted to find the best dehumidifier for basement, so we have gone through reviews, tested products, and reviewed the performance of the top models on the market, narrowing it down to the top 10 dehumidifiers. This evaluation is based upon over 55 hours of research on the web, spending time testing the actual products to see how well they perform in standard basement conditions, and comparing features of these dehumidifiers to one another. The main purpose of our evaluation was to give you a solid review so that you would know what is the best basement dehumidifier for your home or business. We want you to have peace of mind knowing that the products that we recommend are ones that offer you features that put it above the others, as well as ones that customers have found to be exceptional. What Exactly Is Meant by a Basement Dehumidifier? If we are going to tell you what the best dehumidifier for basement is, then the best place to begin is with an explanation of what a basement dehumidifier is. These appliances are used in large areas, such as basements, garages, or crawl space units, locations where the temperatures are usually less than what you would find throughout the rest of the home but where humidity and moisture are likely to build up. The purpose of the basement dehumidifier is to remove the excess moisture by removing the condensation from the air and draining it through a hose or reservoir where it is removed from concern. The truth is that a damp, musty basement can be a serious health risk to your family and it can lead to damage to your home. Moisture can turn to mold and mildew which can damage walls, carpeting, and ceiling tiles, and also cause respiratory issues for you, your family, and your pets. As moisture continues to blossom, this can lead to would and other substances becoming rotted, rusted, and even bring insects and other little critters that can cause problems for your home. Getting one of the best quality basement dehumidifiers can help to control this moisture buildup and create a much healthier environment for you and your family. You don’t want to see your home damaged or your family get sick, and this is why this appliance is so vital for your home. While it is always good to have this kind of appliance in your home, there are definitely instances where you should find that it becomes an even greater priority. If you are noticing such things as unusual odors, that it is more damp or humid in your basement area, or condensation is building up on cold services, you may be having an issue where looking for the best dehumidifier for basement areas becomes absolutely essential. This is not the only kinds of issues you should be looking for, however. If you are seeing that there is frost or ice buildup around cold services, that you can see such things as rotting or decay on the walls, flooring, ceiling, or other structures within your basement, or if there is peeling or cracking of paint then you may have a very serious issue. Looking for a basement dehumidifier system is extremely important, and is why we are making this recommendation to you. What you should be aware of is that a humidity level greater than 50 percent is a cause for concern. If you live in an area where humidity is known to be an issue during certain times of the year, that it is likely that this can lead to higher condensation levels within your basement. You will be surprised at how the best dehumidifier for basement on the market can make your home a lot safer and more comfortable for you to live in. While getting a dehumidifier is a great idea, getting the right capacity of dehumidifier is important as well. You want to make sure you get an appliance that is a whole basement dehumidifier in terms of the space that needs to be covered, but if you have a smaller sized area then you may not need a large capacity option. Moderately Damp Conditions – if you have a basement that is moderately damp, then what you need is a dehumidifier that can handle 10 pints of water removed from the air in a 500 square-foot area. For every 500 additional square feet you need at least four additional pints in terms of capacity, so a 1500-sq. ft. area would require a dehumidifier that could remove 18 pints of water. Very Damp Conditions – if the conditions are extremely damp, where the amount of humidity is quite noticeable, then you will need something that can extract 12 pints per 500 ft.² of water, where every additional 500 ft.² adds 5 pints. Wet Conditions – For conditions that are wet, where there are noticeable puddles or pockets of water, such as around the shower area, then you will need a dehumidifier that can remove 14 pints of water for 500 ft.². Each additional 500 ft.² requires an additional 6 pints of capacity. Extremely Wet Conditions – if you are in an area where your basement may flood at times or you may have water buildup for other reasons, then you need the highest level capacity dehumidifier. This should remove 16 pints of water for the first 500 ft.², and add 7 pints for every additional 500 ft.². Two terms that you will want to be familiar with related to basement dehumidifier reviews ratings are ACH and CFM. ACH stands for air changes per hour, which tells you the amount of air that will pass through the dehumidifier each and every hour. This rating tells you what airflow is needed to properly remove moisture from a specific area. Extremely Wet:- when humidity levels are somewhere between 90% and 100%, you may see puddles or standing water. This is when you need an ACH of six. Wet:- when humidity levels are between 80% and 90%, where you may see wet spots, stains, mold, or mildew, the ACH needs to be five. Very Damp:- humidity levels of between 70% and 80% are recommended to use an ACH of four. Here you will see such things as moisture on the walls, floor, or smell mildew. Damp:- when humidity levels are between 60% and 70% and ACH of three is recommended. Here, the room will smell musty and it may feel damp in the air. CFM is determined by multiplying the cubic square footage of the room by the ACH level, and then dividing that number by 60. If you discover that you are unable to find a basement dehumidifier system that meets the CFM level required that you then by two different appliances. Now that you have an idea about the usefulness of a dehumidifier, knowing which option you want for yourself is really important. This is why it makes sense to know what are some of the different features that make for a good dehumidifier and also how it works. The ability to operate in lower temperatures means that the dehumidifier is able to remove moisture out of the air in temperatures as low as 33°F. You may not have your basement or garage area reach temperatures this low, but still may need a dehumidifier that operates in 55°F or around that temperature. If you are needing to operate your dehumidifier in an area where you expect the temperature to be below 40°F, then you need an auto defroster that will help to keep coils from becoming frozen so that water does not build up in it. If the power should go off for some reason, having an auto restart that will automatically reactivate the dehumidifier once power is restored is something you may find necessary. If you are wanting to ensure that a level of humidity and temperature is achieved, then having a digital humidistat or hygrometer can be of great advantage. This will let you know what level has been achieved, and in many of these dehumidifiers, you are able to set a condition where the appliance will shut off once that is reached. If you don’t want your dehumidifier running all the time, then an auto shutoff may be what you are looking for. This can be set to shut off after a certain period of time or one a certain level of humidity and temperature is achieved. If you are not intending to set up your dehumidifier so that water is dispensed to a drainer out the window, then you need a water collection bucket that will properly hold the amount of water you need depending upon the condition in your basement area. This may mean that you need to look into such things as the best 70-pint basement dehumidifier, 60-pint basement dehumidifiers and the like to see what works for you and how much water can be stored in the dehumidifier. Maybe you need to run your dehumidifier continuously and so using a water collection bucket does not work. You may need to find the best dehumidifier for basement system that enables you to be able to run a tube out of the dehumidifier that will deposit the water in a drain or out a window. Not every basement has a tile, cement, or other constructed floor type. Some still use dirt, which can be counterintuitive in terms of the success of the dehumidifier. If you have a dirt floor, you want to make sure that your dehumidifier is able to remove moisture from dirt. Many dehumidifiers can be quite noisy, which may be of no consequence to you, but can be disturbing to some who don’t want the constant droning of the dehumidifier running. You will want to make sure that the noise level is something that is acceptable to you, or look for the best dehumidifier for basement that isn’t a noisemaker. The pint capacity is the amount of water that can be removed from the air in a 24 hour period of time. The coverage area is the amount of cubic or square footage that the dehumidifier is able to successfully work to be able to remove water from the air. Some look to do run their dehumidifier for short periods of time, and so the use of a timer would enable you to be able to control how long the dehumidifier was running. Should You Upgrade Your Dehumidifier? An important question that many people ask related to the current dehumidifier that they own is whether they should buy a new one or not. A lot of people like to buy the new shiny object, and so when they see a more powerful dehumidifier they think that they should spend the money on it. The truth is that if your current dehumidifier is doing the job for you then there is really no reason to upgrade. However, if you are finding that it is filling up way too quickly, causing it to shut off because the water collection bucket is filled up within eight or 10 hours, or the amount of moisture it removes in the air is not adequate enough, then it may be time to upgrade. Let your needs and your ability to pay for a new dehumidifier guide your conscience. If a new basement dehumidifier is what you were looking for, then we have already given you some outstanding information to consider. However, we want to spend a little time explaining to you how we came up with our top 10 list. Are process of choosing our list began with doing some practical testing using a number of volunteers. They examined how effective the different basement dehumidifiers are under various circumstances, spending four years collecting data and reporting the information that they recorded on the over 20 different dehumidifiers that were tested. While none were found to be perfect, there were clearly some that proved to be better than others. In addition, our team examined a number of consumer reports dehumidifiers for basements reviews as well as basement dehumidifier reviews ratings to see how these different products for rating in comparison to one another. This helped to give us a more conclusive determination as to what is the very best. After gathering all of our data, we developed a guide as to what would be the key factors that would rate one dehumidifier over another. This included such things as pint capacity, low temperature operation, auto restart, coverage area, auto shutoff, wheels, exterior assembly, air filter, appearance, weight, and much more. We examined 38 different features, comparing how each rated against one another, so that we could come up with a conclusive basement dehumidifier review that you can count on. In addition, we examined how consumers felt about each individual product. This not only included finding how quickly customers reviewed the product once they had purchased it, but also how enamored they were with their new dehumidifier. 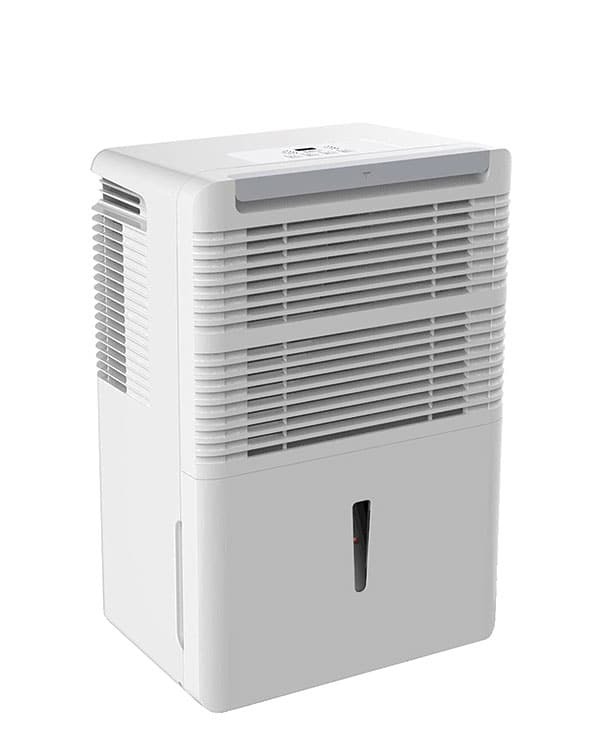 After examining and comparing all of the different dehumidifiers that we reviewed, we came up with a conclusive list as to which are the very best based upon the 38 most important features we found with this product. While no single basement dehumidifier is absolutely perfect, we believe that we have found the best dehumidifier for basement for you by providing you with the top 10 list of the very best options on the market today. To be able to review this entire list, we ask our readers to like this post on their social media account. This will give you complete access to the overall review. 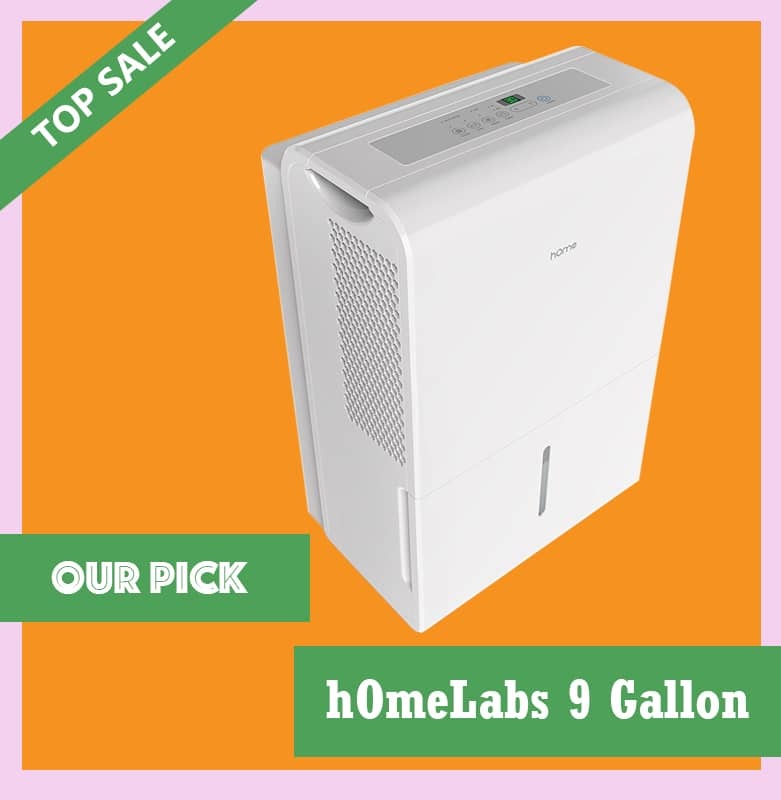 The HomeLabs 9 Gallon dehumidifier offers 70 pint moisture removal per 24 hour period for areas between 2,500 and 4,000 square feet. Of the over 20 dehumidifiers tested, this proved to be our number one choice because it provided the highest number of positive features of the 38. This product not only operates at low temperatures, but is an energy saver which can also save you money in the long run. The capacity for moisture removal and a 24 hour period of time is 70 pints and can handle spaces between 2,500 to 4,000 ft.² at room temperatures from 41°F to 95°F. The dehumidifier provides a continuous drain option, a 24-hour timer, auto shutoff and auto defrost. This is also certified by Energy Star as an energy-saving appliance. This also proved to be the best dehumidifier for basement options because of its price range. Costing about $200 made it one of the more affordable options, as it is the second lowest price in comparison to all basement dehumidifiers tested. Customer reviews were also quite important. Within the first day of purchase, 20 different positive reviews were posted and 30 positive reviews came within three days of purchase. 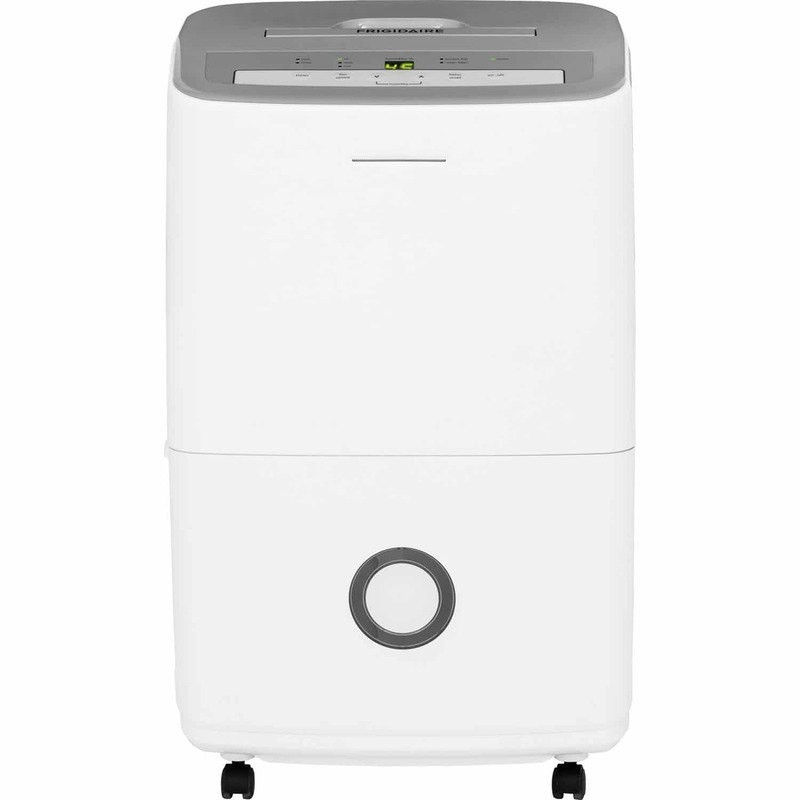 This dehumidifier provided a unique blend of the most important and effective features related to our list, and it can be operated in turbo mode. This helped to really make it stand out. This particular category covers the amount of water that can be removed and a 24 hour period of time as well as the overall coverage area that the dehumidifier is expected to remove water from. In the case of the hOmeLabs9, this offers 70 pints of moisture removal per 24-hour and a 2500 to 4000 square-foot cover area, making it one of the very best on the market in both categories. The defrost mode category relates to whether the dehumidifier offers an auto defrost to keep the coils from becoming frozen in cooler temperatures. In the case of this dehumidifier, it offers an auto defrost. Operating temperature range – the operating temperature range is the temperature at which the device will operate. In some dehumidifiers, if the temperature is too high it may be unable to keep up with the amount of moisture in the air or if the temperature is too low it may not be able to function because of frozen water buildup. This dehumidifier offers an effective range of 41°F to 95°F. 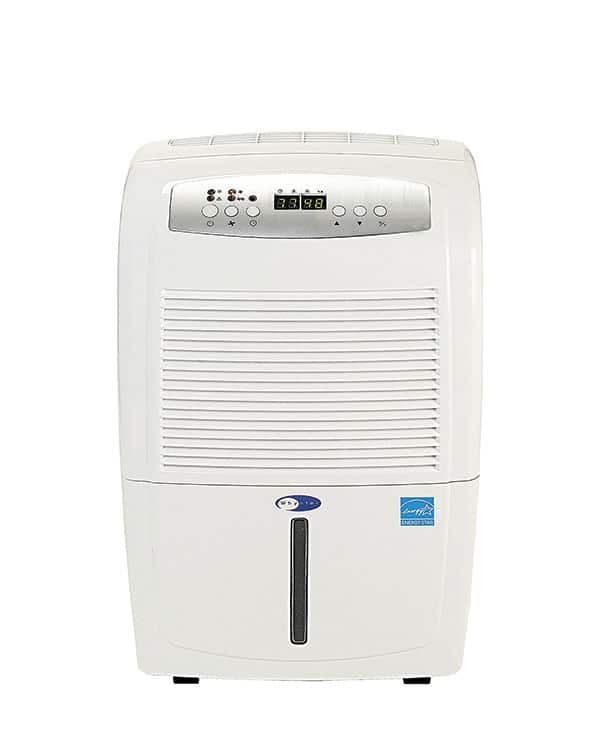 Virtually all dehumidifiers you by will come with a water container that will store the moisture taken out of the air. However, some come with the ability to drain the water through a pipe or tube connected to the dehumidifier so that it can continue to run without the reservoir becoming filled. This dehumidifier offers a 12.8-pint container and the ability for continuous drain operation. In purchasing a dehumidifier you may find that the best dehumidifier for basement option is one that comes with a large number or a diversity of options. This dehumidifier not only comes with a humidistat, but a timer, removable filter, and even a two-year warranty. There is even a touch control panel that makes setting the dehumidifier controls extremely easy to do. One concern that many have related to their dehumidifier is what will happen if the powers should suddenly go out in their home. While the dehumidifier does not work during this time, if you are a person who wants to ensure that it comes back on when power is restored then you need an auto restart. You may also be someone who wants a timer control that will run the dehumidifier for certain periods of the day or for certain periods of time before shutting off. This dehumidifier comes with an auto restart and a timer, giving you both functions. Continuous mode enables you to continue to run the dehumidifier because you have a continuous drainage system and the appliance itself can handle the rigors of being able to run continuously for days. This dehumidifier is a tough one, that can handle the rigors of moisture removal while giving you the continuous drainage option so you don’t have to worry about the reservoir filling up. 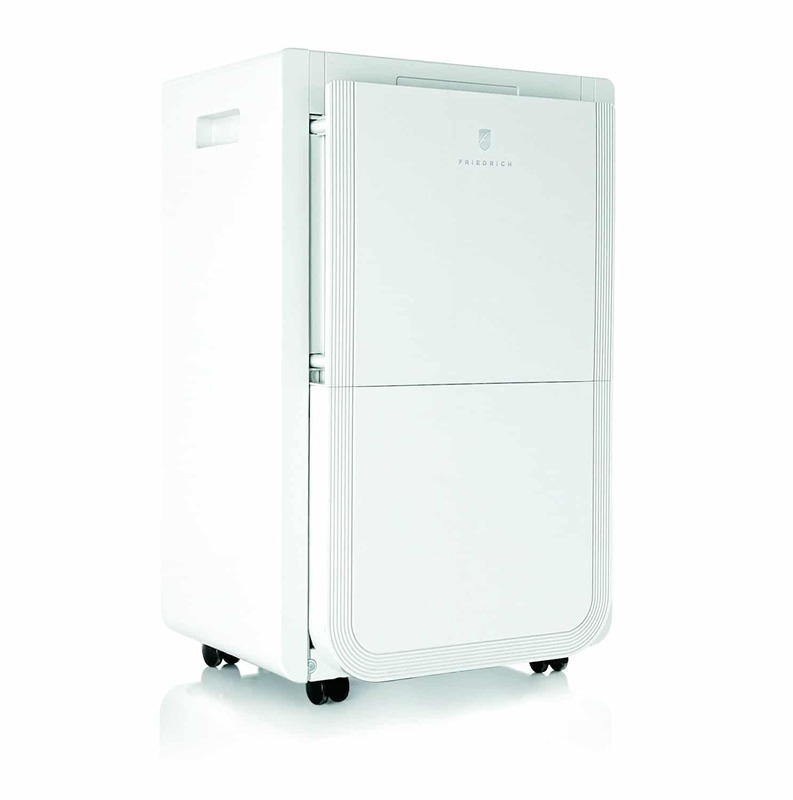 The features offered with this residential dehumidifier make it the ideal choice. If you are wanting a top-notch product that works within your budget then you will find that there is really no other choice for you. Simply a great choice for those who need an efficient option that will cover a large basement or storage area. Provides exceptional features like auto shutoff/restart, rotary control, auto defrost, continuous drainage, etc. The Frigidaire 70-Pint Dehumidifier features Ready Set controls and continuous drainage operation to maintain comfortable humidity conditions in your basement. Our team also found this to be an exceptional basement dehumidifier. There are many positive features, simply not as many as that of our top choice. However, it did receive a number of positive reviews, as its top 30 reviews all came within two days of people purchasing and receiving the appliance. The removal capacity is 70 pints and it comes with a number of features that you will really like, including electronic controls, digital humidity readout, a 24-hour timer, and is also Energy Star rated. What really put it into the second slot was the fact that it is a little more expensive than our pick. This is a 70-pint dehumidifier with the coverage area greater than 2500 ft.². There is an auto defrost, so should the temperature reach temperatures that could cause the coils to freeze the auto defrost will kick in to stop this from occurring. The low temperature range to this dehumidifier is 41°F while the upper range is 95°F. There is a 13.1-pint container included in the dehumidifier and it also offers a continuous drainage operation. There are a lot of great features included in this dehumidifier, including an adjustable humidistat, three different fan speeds, a lower noise level, a full tank alert system and much more. There is an auto restart and timer included. This Frigidaire dehumidifier also offers an adjustable humidistat to control when the devices on. Because of the continuous drainage option, you are able to run this dehumidifier in continuous mode. It is really the cost that separates this from our top option. The fact that it comes with a 113.1-pint container and operates in a rather expansive temperature range makes it a great choice, and one that you will find ideal if it fits within your budget. We did love the fact that this dehumidifier comes with the Ready Set Controls, which makes it incredibly easy to operate and maintain comfortable conditions in your basement or other areas. Great in low temperature settings. Does not come with an auto restart. 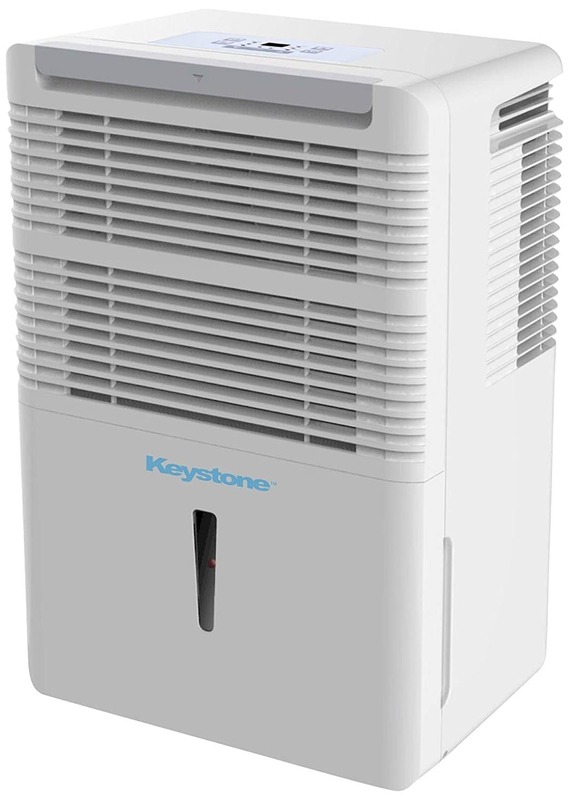 The Keystone is a cost-efficient dehumidifier that boasts of a 50-pint capacity per 24 hour of use with a coverage of 3,000 square feet. This is the best dehumidifier for basement because it actually provides the lowest price of all the different products we tested. You can doubtlessly choose this product if you’re worried about the cost of buying and maintaining a dehumidifier. There are many great features associated with this appliance, making it a quality choice at its price. It has a capacity of 50 pints per 24 hours, but its coverage area is quite extensive, up to 3000 ft.². The features for this dehumidifier include an auto defrost mode, a continuous drainage option, and it even comes with a hose for the continuous drainage. As far as customer reviews, it received its first positive ratings within 10 days of purchase, its second 10 positive reviews within three days after that, and its third set of 10 within seven additional days. There is an LED display, it includes a 24-hour timer, and the transparent water level indicator makes it easy to determine if the water bucket needs to be emptied. This is a 50 pint in 24 hour period of time appliance. The coverage area is 3000 ft.². There is an auto defrost mode that is included with this appliance so as to remove concern related to frozen coils. Built to operate most efficiently at 45°F to 95°F. There is an auto defrost should it be used in colder temperatures. This dehumidifier comes with the reservoir as well as a continuous drainage system. For those looking to operate this appliance on a continuous basis, a hose is included to attach to the dehumidifier to aid in removal of water. This 50-pint dehumidifier for basement areas comes with a 24 hour on/off timer as well as a full tank alert system. Other features included with this dehumidifier are such things as a removable filter and LED display. There is not an auto restart should the power go out, but it does include a timer. Continuous mode – the drainage hose allows for continuous operation. Finding a quality dehumidifier that comes at a lower end price can often be a real challenge, but the manufacturers of this appliance have found a way to provide an outstanding residential dehumidifier that is also portable while also being able to offer it at a price that is affordable to almost anyone. Received a significant number of positive reviews. Large number of positive features for the price. Only removes 50 pints of moisture in 24 hours. 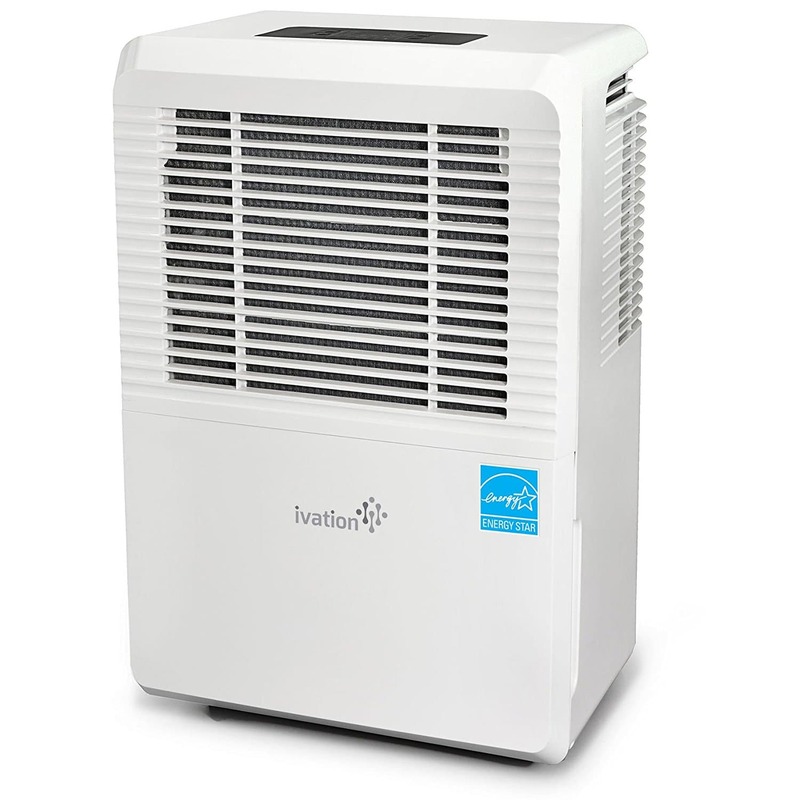 The Ivation boasts of a straightforward design that makes it easy to use and operate, while effectively dehumidifying the air with its 70-pint capacity and coverage of 4,500 square foot. If you are looking for a dehumidifier that is simple to use, then our basement dehumidifier review found this to be the very best. It provides you with easy access and LED display, aside from offering easy access for cleaning and maintenance. The product provides coverage of 4500 ft.², and can remove up to 70 pints of moisture per day. The design of this basement dehumidifier includes a simple LED interface, a humidistat, and gives you the capability to adjust the fan setting, set the levels you would like in terms of ACH, and provides reservoir alerts should it become full. This is a 70-pint dehumidifier, with an impressive coverage area of 4500 ft.². There is an auto defrost function included in the dehumidifier to ensure that coils do not become frozen during operation. The coverage range for optimal efficiency is between 42°F and 95°F, but this can operate at lower temperatures. There is a continuous drainage system available, and this comes with an impressive 18-pint reservoir, the largest of all of the products in our top 10 list, making it a quality choice. Included is a 24 hour on/off timer, as well as a full tank alert system, adjustable humidistat, reduce noise level, and Ready-Select Controls, which make it a top product for sure. Auto Restart & Timer – an auto restart is included as part of the features of the dehumidifier, as is a 24-hour timer. There is a continuous mode provided by the continuous drainage operation. For those out there who simply want to be able to make their basement or other similar areas a more comfortable location, this is a fantastic choice. Because of how easy it is to use as well as how efficient it operates, there are very few reasons not to like it. It is clearly for those who need a quality residential product without having to worry about spending hours in a user manual. Has a large coverage area capacity. Offers auto restart as well as built-in drainage pump. Smallest number of positive reviews in our top five. One of the highest rated dehumidifiers in terms of features, humidity range, continuous drainage operation, plus its Energy Star rating. BLACK+DECKER has been known to create outstanding appliances, and this is a great choice. The fact that it covers a rather large area, over 3,500 square feet, makes it a great choice that has truly lived up to the BLACK+DECKER name. This was also one of the most positively residential dehumidifiers that we tested, which lets you know that consumers liked it as well. This BLACK+DECKER dehumidifier has a 70-pint per 24-hour capacity, and a coverage area of over 3500 ft.². Included is an auto defrost function to ensure that coils do not become frozen. The operating range for this dehumidifier is 41°F to 95°F, and includes an adjustable thermostat with digital display to ensure accuracy. There is a continuous drainage operation capability with this dehumidifier, and a reservoir that could hold up to 14.8 pints of water. A 24-hour timer is included, this dehumidifier is Energy Star certified, comes with an auto restart, and an auto shut off. Also included is a full tank alert system. Included is an auto restart as well as a 24-hour on/off timer. The continuous drainage operation ensures that this device can be used in continuous mode. This is one of the highest rated and most efficient dehumidifiers in terms of relative humidity ranges, providing 30 percent to 90 percent, which was tied for the best range. While it does not offer as many features as some of the higher rated options, it is features like this that help it to stand out. 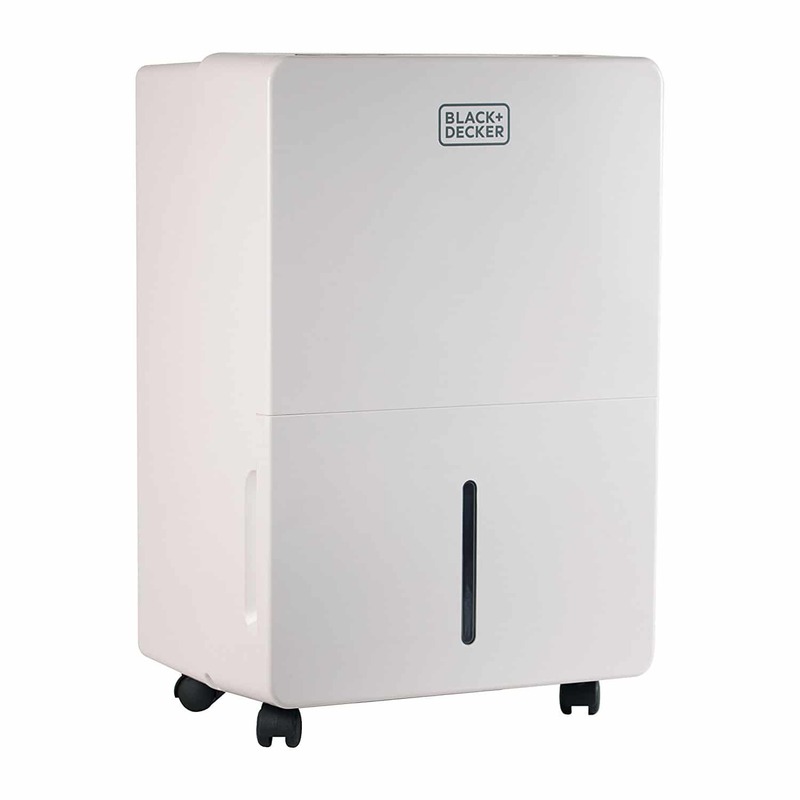 If you are a BLACK+DECKER fan and currently in need of a dehumidifier, you will love this residential dehumidifier. No coverage area capacity specified. This 70 pint per 24 hour capacity dehumidifier boasts of an anti-defrost mode, continuous drainage system, on-off timer, auto-restart feature, and a coverage of 4,500 square feet. This Keystone dehumidifier removes up to 70 pints of moisture in a 24 hour period of time and offers the largest coverage area, serving over 4500 ft.² of area. The use of electronic controls and LED display make it easy to operate, and it comes with a variety of features that make it ideal for any home. You will like its ability to be able to continuously operate, as well as providing an auto restart and shut off. This is a 70 pint per 24-hour capacity dehumidifier with an impressive coverage area of 4500 ft.². The anti-defrost mode is included to allow for operation at lower temperatures. The optimal temperature range for this dehumidifier is between 42°F and 92°F. This dehumidifier comes with a continuous drainage system and with the small-sized reservoir contained within the dehumidifier. There is a 24 hour on/off timer, as well as other features including a humidistat, full tank alert system, and clean filter reminder indicator. It also has an outstanding LED display. There is an auto restart feature which will restart the dehumidifier after a power outage, as well as a 24 hour on/off timer. Because it provides a continuous drainage system, this can be run in the continuous mode as well. 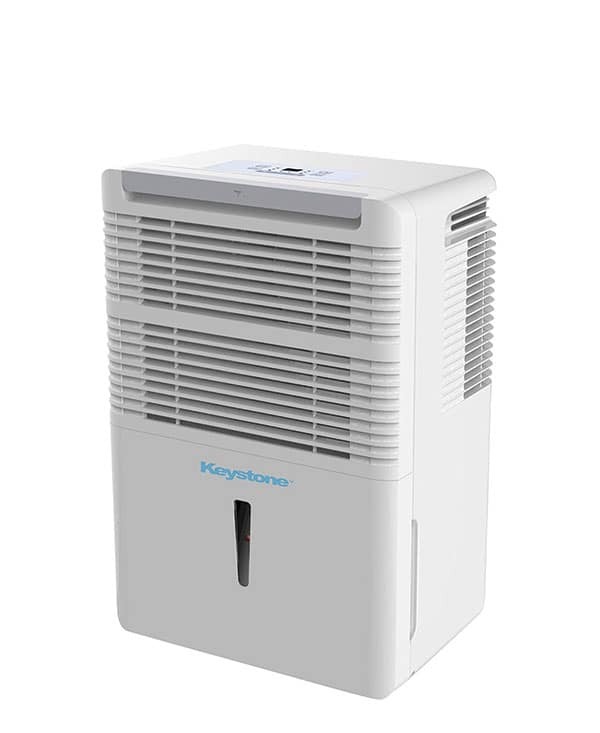 Keystone may not be a brand you have heard of before, but this residential dehumidifier comes with an efficient pump that will really do a fantastic job for you. The fact that it covers the largest area makes it an ideal choice, and it does have a wide operating temperature range. At its price, it’s a good option to take a look at. Received one of the largest numbers of positive reviews. Great coverage area at 4500 ft.². Price makes it a great value. No warranty included with the appliance. The Friedrich boasts of an Energy Star efficient rating, 70 pint capacity, 24 hour on/off switch, auto restart and auto defrost options, with a relative humidity range of 30 percent to 90 percent. This Energy Star efficient dehumidifier also has a 70-pint capacity and plugs into a standard outlet, ensuring that no additional work needs to be done by you to get this dehumidifier going. It comes with a built-in drainage pump with a 15-foot drainage tube that gives you greater flexibility on where to position dehumidifier in your basement or other storage areas. With a 24 hour on/off switch, auto restart, and auto defrost options, this is an outstanding choice. 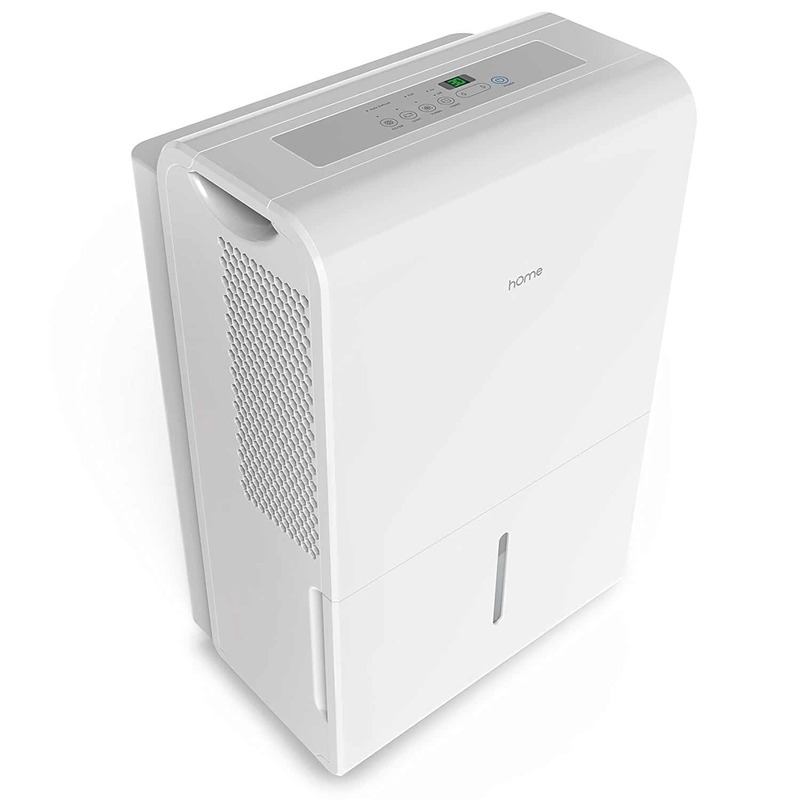 This is a 70 pint per 24 hour period dehumidifier, but comes with one of the lowest coverage areas at about 2000 ft.². There is an auto defrost to help ensure that the operation of the dehumidifier continues in cold temperatures. The optimal temperature range is between 43°F and 95°F. This dehumidifier comes with a 15-foot tube that can be used to create a continuous drainage system. There is a small capacity reservoir to store water. There is a 24 hour on/off timer, as well as a humidistat. The dehumidifier is Energy Star certified,has a removable filter, and an easy to use LED display. This dehumidifier has an auto restart feature but there is no auto shut off. It also has a 24 hour on/off timer. Because of the continuous drainage system available, this offers a continuous mode. There is also a built-in drainage pump. The primary limitation of this dehumidifier is the fact that it only provides 2000 ft.² of coverage area, far less than many of the higher rated options in our review. While we like the efficient pump action of this appliance and the fact that it has a relative humidity range of 30 percent to 90 percent, it did lose some points because of its limited coverage capability. 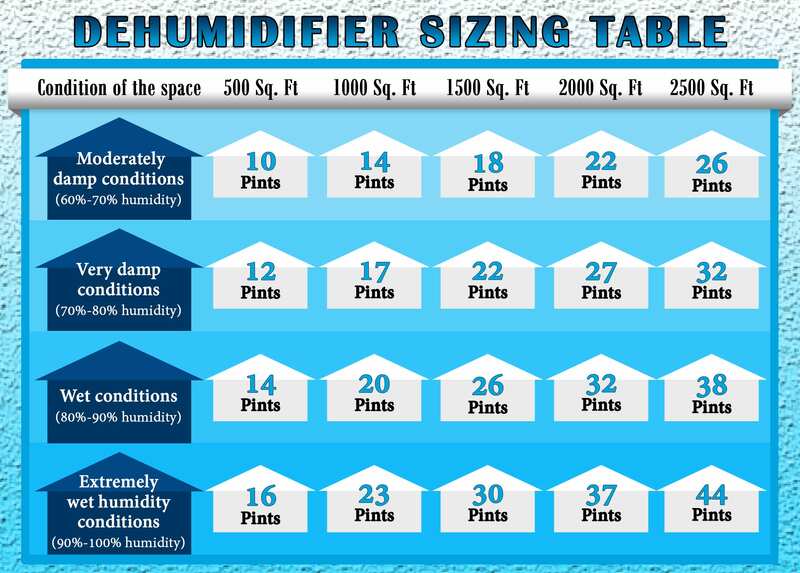 The largest relative humidity range of the appliances in our review. Price is quite expensive especially considering coverage area is rather small. The Ivation boasts of a small yet compact and portable design, with many of its features that can be controlled such as the humidistat, filter alert, fan speed controller, and timer. This is a beautifully designed dehumidifier that also provides 4500 ft.² of coverage area, tying it for the highest rating in our best basement dehumidifier review. This has one of the most powerful and efficient operating systems, making it so that it can easily remove allergens and odors, while also reducing moisture. It is a low maintenance option that is also Energy Star certified and comes with several features that make it a great option for your home. This Ivation option removes 70 pints of moisture per day and has a coverage area of 4500 ft.². There is an anti-defrost mode to handle cold temperatures and ensure that coils do not freeze. The operating temperature range is 44°F to 94°F. There is a continuous drainage system as well as a 10.4-pint water reservoir. A 24 hour on/off timer is included as well as such features as an easy roll caster, extra long cord, user-friendly LED display, built-in relative humidity meter, and a convenient timer. There is also a safety shutoff valve. The dehumidifier can run in continuous mode thanks to the drainage system provided. The fact that you can control many of the features of this dehumidifier make it a great choice, including such things as a humidistat, fan speed controller, timer, and filter alert. Over 260 reviews were also provided for this dehumidifier, an impressive number, but people were not as quick to provide positive reviews as they were with some other options, as it came in with the eighth quickest of all of the products reviewed. Great coverage capacity at 4500 ft.². Only 14 positive features included. Clearly better choices at the price you’re paying. Works efficiently in cold temperatures. The Danby stands out with its large coverage of 4,500 square feet and anti-defrost system, which makes it the ideal dehumidifier in near-freezing temperatures. 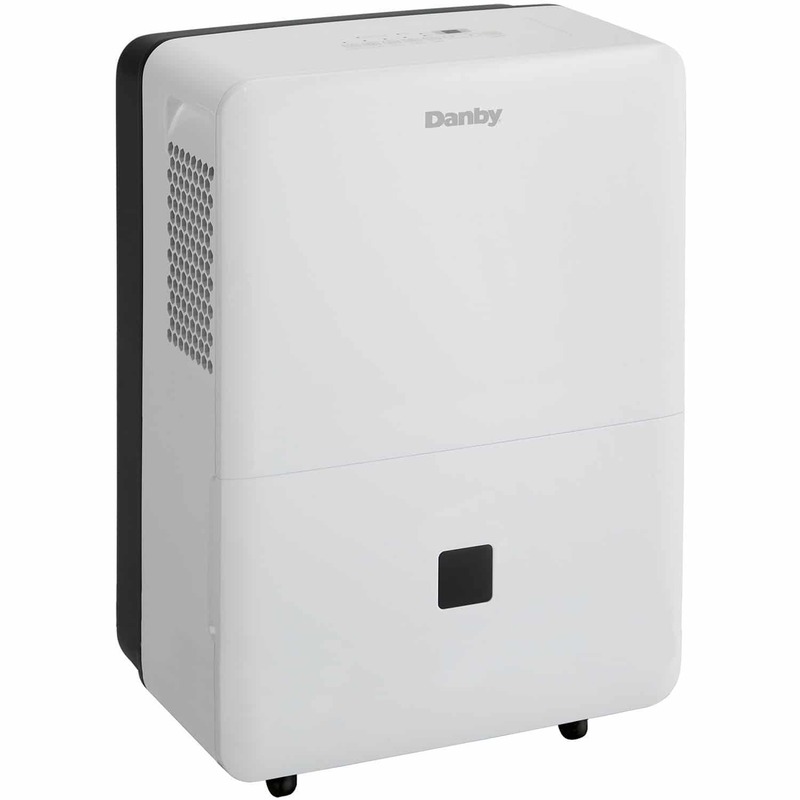 This Danby residential dehumidifier is a great option, also covering 4500 ft.² of area, depending upon the conditions, and coming with a great low temperature operating range of 41°F, making it one of the best in terms of operating in near-freezing conditions. It comes with such features as a full tank indicator, and auto restart, and to fan speeds, to go along with a 12.7-pint capacity reservoir contained within the appliance. This dehumidifier removes 70 pints of water per day, and has a coverage area of up to 4500 ft.², depending upon the conditions the dehumidifier is being used in. There is an anti-defrost mechanism to ensure that the dehumidifier continues to run during cold temperatures. This dehumidifier runs at a low temperature of 41°F up to 92°F with great efficiency. The dehumidifier comes with a 12.7-pint water reservoir, and also comes with a continuous drainage system. A 24-hour on/off timer is included as well as other features which include auto shut off, an Energy Star certification, and adjustable humidistat, plus low temperature capability that can go under 41° and still operate efficiently. And auto restart as well as a 24 hour on/off timer are included as features of this dehumidifier. This is a dehumidifier that is able to run continuously because of the drainage system that is offered. Operates effectively at low temperatures. Very low number of positive reviews. Low number of positive features. The Whynter dehumidifier is an exceptionally reliable, high capacity unit with excellent low temperature functionality that works efficiently even after high volume usage. This Whynter appliance is a great portable dehumidifier with a pump that can remove 70 pints of moisture from the air in a 24 hour period of time. It is an Energy Star certified option, which operates quite well at extremely low temperatures. Inside is an internal condensate pump and this dehumidifier is specifically designed by the manufacturer to handle a continuous workload with high-volume usage while not breaking down. This is a unit you can use to enjoy all the benefits of a dehumidifier. This is a 70 pint per day removal of moisture dehumidifier. A defrost mode is included, which helps to ensure that coils and other sensitive areas do not freeze. The optimal temperature range is between 42°F and 94°F. A continuous drainage system is offered with a 3-foot long tube, but there is also an 18-pint reservoir included. There is a 24 hour on/off switch, as well as other features including such things as an auto shut off, adjustable humidistat, Energy Star certification, and an impressive and easy to read LED display. There is an auto restart and a 24 hour on/off timer included. The drainage system offered in the dehumidifier makes it so that continuous mode can be achieved. This dehumidifier provides a large number of features that made it a good choice, including its relative humidity range of 30 percent to 90 percent. However, despite the fact that it had over 300 positive reviews, it received the slowest rate for its first 10 positive reviews, taking more than 40 days and it took nearly 3 months to receive 30 positive reviews. We also were a little concerned by the fact that the manufacturer does not stand behind a specific coverage area, which is a cause for concern. Great price that is affordable to most budgets. High number of positive reviews. Tied for the largest relative humidity range. Received the lowest overall rating. No matter which basement dehumidifier you decide is best for your home or business, you should be aware that to ensure that they operate well and that you continue with the greatest efficiency possible, you take the proper care and provide the proper maintenance of the dehumidifier. This means replacing filters as scheduled, cleaning coils and other areas of the dehumidifier on a regular basis, and providing any other maintenance recommended by the manufacturer. Also, you should follow the specified guidelines for how the dehumidifier is supposed to be used. If temperatures recommend a low of 41°F you should not be using the dehumidifier in temperatures that are much lower than this. You risk causing serious problems with the motor or other mechanisms within the appliance, causing it to have a breakdown. The same care that you provide to take care of your car is the same kind of care and maintenance that you should provide for your dehumidifier. Here are a few questions we would like to answer for you. 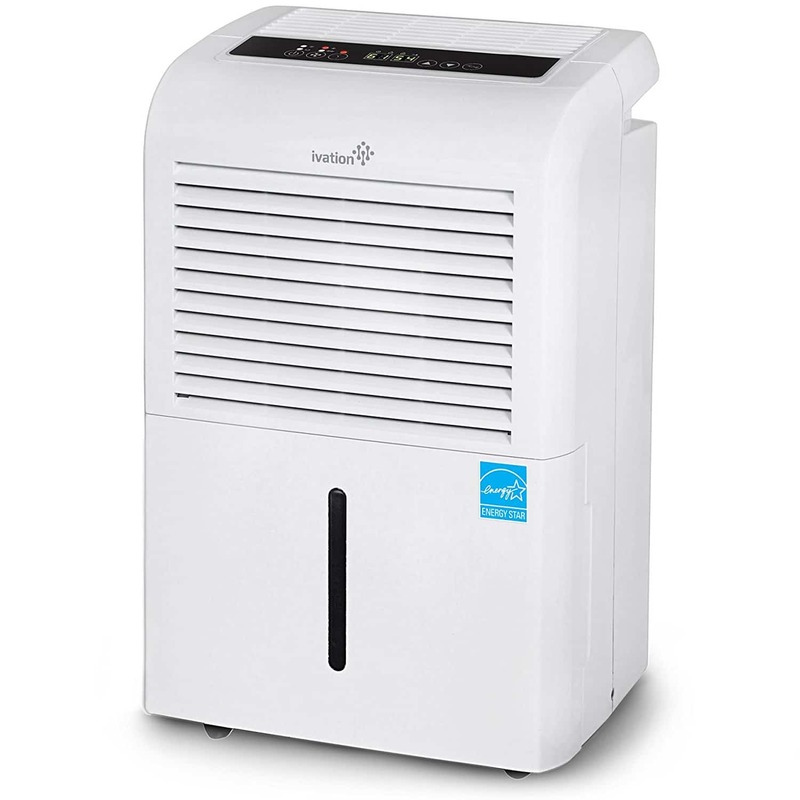 Should I use a desiccant dehumidifier to dehumidify my basement? A desiccant dehumidifier is one that uses refrigerants to cool metal coils so that moisture in the warmer air can be condensed, thus removing moisture from the air. Clearly, this type of dehumidifier works much more effectively in locations where the temperatures are higher. Consider you wouldn’t run your air conditioner when it was 40° inside your home. The same would be true in using this type of dehumidifier. What is the right choice for my basement? Desiccant or Refrigerant? The reality of this question is related to the situation in your basement. Consider that the cooler temperatures should determine which kind of dehumidifier you should use. The warmer the dehumidifier the better it is to choose a dehumidifier that pulls in warm air to cool it to remove moisture. Do I have symptoms of high humidity? This is a question that people commonly ask. They want to know how they can tell if there is a lot of humidity in their basement area. The answer is that it is actually a lot easier to tell than what you may think. If you are noticing that condensation is building up on metal objects are on the walls in your basement area that it is likely that you have a high level of humidity and moisture in the air. One way that you can tell for sure is that it will literally be more difficult to breathe in higher humidity environments. It feels like the air you are breathing in is heavier to breathe in, which is a symptom of high humidity. If you were wondering why you should buy a dehumidifier before going through this review, we hope we provided enough information to help you make up your mind. We also hope that you will now be easily able to find the best dehumidifier for basement. This is not only an investment in terms of purchasing your dehumidifier, but is also one in protecting the health of your family and the foundation of your home. This is why you want to make sure you are making a decision that will keep your environment comfortable and safe.